Business intelligence solution QlickView enables users to build their own guide analytics apps using data and insights gleaned by the system. This, in turn allows organizations to respond more quickly to changes in requirements while providing valuable insights, which can be applied across the organization. You can use QlikView’s Associative Data Indexing Engine to find hidden trends and patterns to inform your next decisions and actions. uncover data insights and relationships across various sources, and improve the quality of your business decisions. To ensure a seamless flow of data between different systems, QlikView offers both default and custom data connectors and open database connectivity connections. The system’s open API ensure that QlikView can blend in literally every software ecosystem, and consequently eliminate the need to use several different systems to process data. To make matters even better, developers gave users the possibility to choose their preferred deployment method – they can use QlikView in cloud, buy a license for a desired number of tokens, or combine both methods. Unlike traditional systems, QlikView reveals connections not easily found by standard tools. It features strong collaborative capabilities to render insights and decisions about them a truly team effort. QlikView utilizes natural search to navigate complex information and accelerate discovery. Alongside its default connectors, QlikView offers custom connectors you can install upon need, including such that import data from Salesforce, Hive, Teradata, and other popular systems. This means that QlikView is perfectly applicable in all analytic scenarios, both when you’re running a small and local business, and when performing enterprise-grade big data analytics. All insights and data visualizations in QlikView are shareable, and employees get to discuss them in real time. You can send those in cloud or via you enterprise server, or simply rearrange parameters and permissions to make data more accessible. 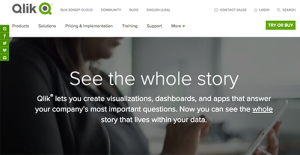 What users appreciate the most about QlikView is that it allows them to create personalized, data-driven discoveries with guided paths and analysis. All discoveries are tightly governed and highly customizable, which means that your employees will be guided while developing insights, and instructed on how to use those to make more meaningful business decisions. BI systems tackle sensitive corporate data, which is why you need QlikView to ensure total control of data access, management, and permissions. For the purpose, QlikView ensures granular control of all dashboards and layouts, and assigns roles to all users. Unlike most traditional systems, QlikView gives users the exact tools they need to build their workspaces, and process data in the desired ways. In fact, you can use its scripts to build custom apps, or extend development with the handy Workbench. On top of that, QlikView is an easily combinable system, and offers extensive APIs for you to connect it with multiple apps and business systems. The system is packed with appealing templates you could use to build accurate reports, which can later on be distributed as Microsoft Office document, or printed directly from the platform. QlikView also makes it possible to generate custom and business-specific reviews. If you are considering QlikView it might also be beneficial to examine other subcategories of Best Business Intelligence Software collected in our database of SaaS software reviews. There are well-liked and widely used systems in each software category. But are they automatically the best fit for your organization’s specific requirements? A trendy software solution may have thousands of subscribers, but does it offer what you require? For this reason, do not blindly invest in popular systems. Read at least a few QlikView reviews and think about the elements that you desire in the software such as the fees, main functionality, available integrations etc. Then, shortlist a few apps that fit your wants. Check out the free trials of these products, read online comments, get information from the maker, and do your investigation thoroughly. This exhaustive homework is sure to aid you find the finest software solution for your firm’s special requirements. How Much Does QlikView Cost? We realize that when you make a decision to buy Business Intelligence Software it’s important not only to see how experts evaluate it in their reviews, but also to find out if the real people and companies that buy it are actually satisfied with the product. That’s why we’ve created our behavior-based Customer Satisfaction Algorithm™ that gathers customer reviews, comments and QlikView reviews across a wide range of social media sites. The data is then presented in an easy to digest form showing how many people had positive and negative experience with QlikView. With that information at hand you should be equipped to make an informed buying decision that you won’t regret. What are QlikView pricing details? What integrations are available for QlikView? Pros: Qlik Apps are simple and easy to use and the good thing is that it can be used even by those who don’t deal with data. It is customizable solution and the data can be displayed in basic format or visually appealing. I like how data can be transferred simple from apps to Excel. Cons: If there is a need to do some calculations with the data you have to export it into Excel or Google Drive. I’m not sure that I can make calculations within Qlik. Pros: I like that we can simplify the flow between screens and views. There are lot of subviews so we can see button driven user environment. There are no difficulties when it comes to customization and building dashboards for data anaysis. Everything is easy and simple with this app. It offers lot of options and features for web browser databases and there is option to export files to Excel or Access. Cons: The speed can be slow when I try to set up the dashboard with Microsoft Access. If you need more information about QlikView or you simply have a question let us know what you need and we’ll forward your request directly to the vendor.